Sunday, September 17 from 10:00 a.m. until 6:00 p.m. 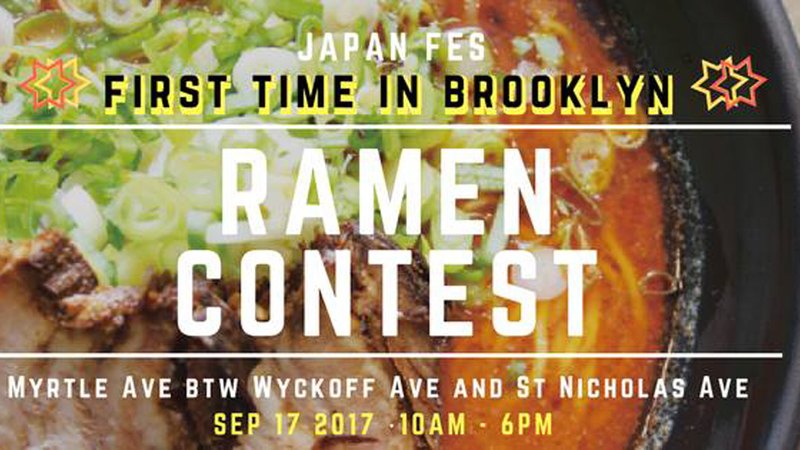 Explore an array of Japanese ramen styles at the very first Brooklyn edition of the JAPANFes Street Ramen Contest. This tasting extravaganza features 15 types of ramen by shops based in Japan, New York, LA, Boston, and Rhode Island. They will go head-to-head to see who will be crowned the ultimate champion, as voted on by JAPANFes attendees. The cost is $10 for one bowl of ramen. Purchase three bowls and receive a free drink. One guest who chooses the 1st, 2nd, and 3rd place winners correctly will win a round trip to Japan! If you’re not too full from sampling ramen, there will be other vendors in attendance to serve a variety of Japanese street food. Wuhao New York will sell tenugui, the Japanese traditional cloth; Wingbot will have kawaii products; and artist Tanaka Yoshimi will sell her pottery and jewelry. Join the Cosplay Revolution at JAPANFes with live music and a dance party hosted by Kohei and TiA, a Japanese recoding artist who sings the end theme of NARUTO. There will be a free cosplay photoshoot and a cosplay contest with the winner receiving $100. For more information, please visit the JAPANFes website and Facebook event page.